They only have 5 pictures total, so it'd be wrong of me to post them all here....but use one of your spare clickies today and go here. 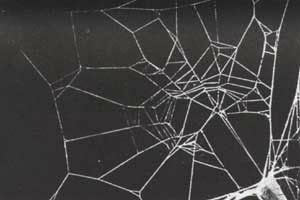 You'll see a normal spider's web at the bottom, and the other four have been fed flies on drugs. The sad thing is, the worst looking one is the spider on caffeine. Doesn't that just scream irony, as it's the only legal 'drug' we have, and yet it sent the spider crazy with its we, where the others are at least usable. My goodness that's scary. I guess it got so hyped up on the caffeine it went bananas. Mind you, a spider has a different digestive system and brain so we can't draw any conclusions about how it affects people. I don't drink anything with caffeine in it except occasionally with chocolatey things. Okay okay I eat a LOT of chocolate but I don't go for coca cola or tea or coffee.